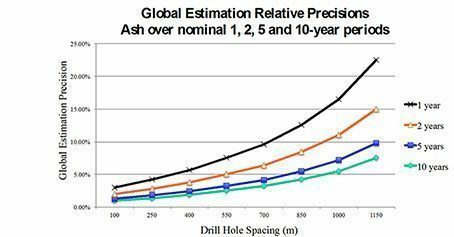 Drill hole spacing should be optimized at all stages of a mining project on the basis of detailed cost/benefit analyses. Geostatistics provides the most robust and objective framework to carry out such drill hole spacing analyses. Geostatistics allows you to quantify the value of acquiring more information in terms of uncertainty reduction. The cost of acquiring information can then be benchmarked against the gains in precision it provides. Maximise the ground covered for fixed drilling costs. The response of the mine plan to resource uncertainty and thus optimize the density and location of new information to minimize identified risks.